On the horizon: San Francisco! Two of my friends and I are planning to visit San Francisco for a week in June. I have not been to California before, and I’ve long been interested in that hilly, foggy city. Its cool summer temperatures will hopefully be a nice break from the usual D.C. hot mugginess. We have some ideas of where we want to go in the city and the Bay Area, but are still in the beginning stages of the plans. If you know San Francisco, what are some tips and recommendations for places to stay, can’t miss destinations, or don’t-bother places? More in the literary vein, what are some recommendations for books that are set in San Francisco? From non-fiction to crime to supernatural, or whatever, what books should I read to get some pre-trip flavor of the city? 1950. Vintage. Paperback. 350 pages. From: I bought this one from an independent bookstore in Vermont. Noel Strachan, an elderly London solicitor near the end of his career, meets a young woman named Jean Paget who is sole heiress of her wealthy uncle’s estate. The uncle was Strachan’s client and had stipulated that Strachan be a trustee of the estate until Jean turned 35 (the uncle had a poor opinion of women as managers of finances). Strachan is struck by the poise and sense of Miss Paget and the two become friends. It is through this friendship that Strachan learns of Jean’s ordeal as a prisoner of the Japanese when she was in Malaysia during World War II. A Town Like Alice takes us back to that story and then follows Jean as she returns to Malaysia post-inheritance, and then on to Australia where she seeks to make her home. 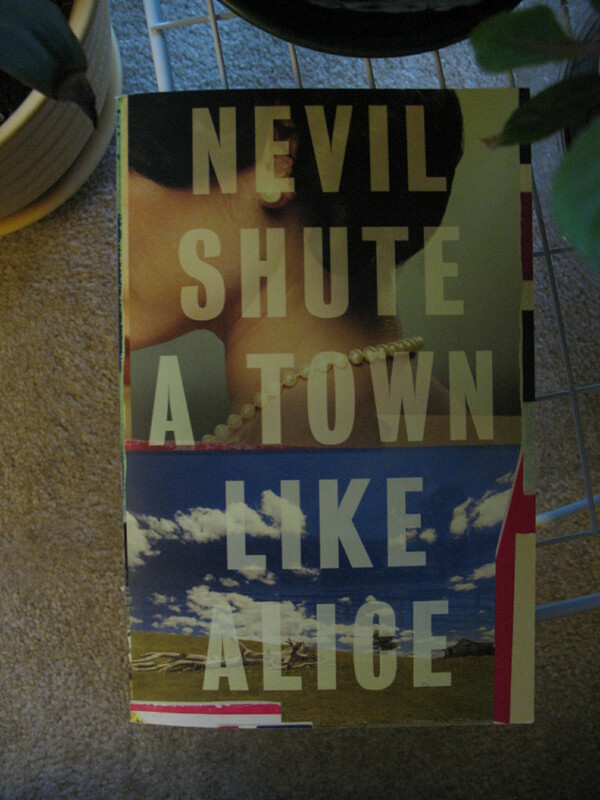 I first read A Town Like Alice when I was in high school. At the time, I knew that Nevil Shute was the author of Pied Piper, because my sisters and I had made that book’s TV adaptation (with Peter O’Toole) an odd favorite of ours. My library at the time did not have Pied Piper but it had A Town Like Alice, so I read that instead. As a teenager, I was a bit impatient with the slow beginning and the Australian section, but I loved the war-time story. A group of women and children, including Jean Paget, are taken prisoner by the Japanese. However, no one of the Japanese military officials wants the burden of overseeing this particular group of prisoners. So they are sent marching all over Malaysia from one Japanese official to another. (Shute based this story on a real occurrence that happened in Sumatra.) Along the way, disease and exhaustion thin the prisoners’ ranks considerably. Jean Paget quickly emerges as a natural leader, aided by her command of the Malay language. Along the way, she meets a couple of Australian prisoners. One of them, Joe Harmon, makes an impression on her and she on him, but then tragedy separates them. Now re-reading this book as an adult, I appreciate the entire story. I like that it is a love story that deals with the practicalities of making a life together. Jean transforms a town so that she can live happily with the man she loves. I admire the character of Jean for her resourcefulness and savvy leadership. It is intriguing how she always seeks to work within the system to institute change. When she negotiates with a Malay chieftain in one part of the book, she tells him, “If there were a man amongst us I would send him to talk for us, but there is no man. You will not be offended if I ask you to talk business with a woman, on behalf of women?” Often Jean is rather slyly subversive in the way she convinces others to see things her way. I do like how Jean is regarded as exceptional by other characters, but not by making all other women in the book seem inadequate. She is often helped by other resourceful women in her endeavors. The book could be a bit cringe-inducing at times in its 1950’s outlook on race, such as in characters’ discussions of the Aboriginal people in Australia. For Jean doesn’t rock the boat when it comes to segregationist practices there. The views of the time also show in its portrayal of gender. For example, it is implied that Jean places sexual desire as the natural realm of men but not women. Whether the characters’ views are similar to Shute’s own views at the time he published the book in 1950, I don’t know. One has to take into account that Jean Paget’s whole story is filtered through the book’s elderly male narrator, Noel Strachan. Which brings me to one final note on A Town Like Alice, which is that the framing narrative given by Noel Strachan is absolutely essential to the novel. Jean Paget’s story is exciting on its own, but the pleasure comes from its contrast with the narrator’s more ordinary life. Noel Strachan is a person of tradition and routine, with his work and his club, and a cleaning lady that comes by. He is absolutely beguiled by Jean Paget, and lives vicariously through her as she travels the world. Noel’s narration gives a lovely bittersweet tang to the novel, and it is he that provides the heart to the novel. 1992. Vintage Books. Paperback. 559 pages. Recommended by: a number of book bloggers, but it was Michael from a Books on the Nightstand podcast whose recommendation initially placed the book on my to-read list. From: I own this one, bought from a used bookstore. In the first line of the prologue, the protagonist Richard Papen says: “The snow in the mountains was melting and Bunny had been dead for several weeks before we came to understand the gravity of our situation.” The book then goes back in time to Richard’s arrival at Hampden College in Vermont, where he seeks to gain entrance into a small elite cadre of classics students. These students – Henry, Francis, Bunny, Camilla and Charles – are well-off, aloof and secretive. After being accepted into their circle, Richard becomes witness and participant in the events that lead to the murder of Edmund “Bunny” Corcoran, and the subsequent fall-out. I had high expectations for this book, based on the praise I had read. As far as the writing is concerned, my expectations were certainly met. In particular, Tartt deftly handles the atmosphere in the book. 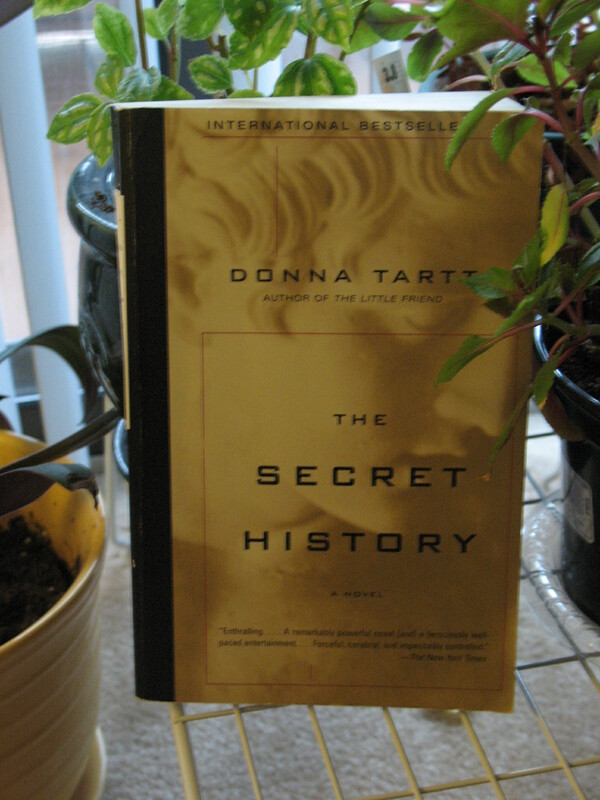 While it can be certainly dark, suspenseful and psychological, as befits the plot, The Secret History also has passages of dreamy atmosphere and sharply observed social scenes. The book is far more than a why-done-it; I don’t begrudge any of its 559 pages. Of course, I can see traces of what went on – to their credit, quite small traces – in retrospect; in the way they would sometimes disappear, very mysteriously, and hours later be vague about their whereabouts; in private jokes, asides in Greek or even Latin which I was well aware were meant to go over my head. Naturally, I disliked this, but there seemed nothing alarming or unusual about it; though some of those casual remarks and private jokes assumed a horrific significance much later. Towards the end of that term, for instance, Bunny had a maddening habit of breaking out into choruses of “The Farmer in the Dell”; I found it merely annoying and could not understand the violent agitation to which it provoked the rest of them: not knowing then, as I do now, that it must have chilled them all to the bone. I think the high point in the novel for me was Bunny’s funeral, as much as that might sound odd. The thoughts and memories that flood into Richard’s mind when he sees the open grave was when the raw horror of the murder came through the strongest for me. To my surprise, I wasn’t very keen on the climactic confrontation scene of the book. I liked some aspects of it, but I felt that I should be touched by the tragic story arc of one of the characters, and I wasn’t. Richard certainly is shook by it, but I didn’t feel much impact as a reader. Also, Richard’s pining for Camilla got a little old for me by the end. But then, I don’t do well with love stories that involve placing a love interest on an unattainable pedestal. Also, I didn’t care much for Camilla. I was much more intrigued by a different character’s unrequited love/lust for Richard, especially as that character ended up being one of my favorites. I was afraid that Tartt would fade out the Hampden College minor characters after Richard joined the elite classics class, and I was so pleased that she kept these more ‘ordinary’ characters around. It made it so much more realistic that Richard would still occasionally hang out with and interact with the larger college community. Jenny of Jenny’s Books has written that this is one of her favorite books to re-read. I can definitely see why you would want to. Knowledge of how the book winds up would lend a new light to the earlier events in the book. If I re-read the book, I want to pay more attention to Richard’s references to his distant parents. Richard says something late in the book regarding his father that suddenly added a new layer to Richard that I hadn’t quite grasped. As the first-person narrator, Richard implies that his parents really have no bearing to this story, but I suspect now that his home life explains a lot more about him than he let on. I’m glad that this book is part of my collection, so that when the urge strikes to re-read, it will be quite accessible. I do plan to write some book reviews this weekend, but last night I went to see Pink Martini perform with the National Symphony Orchestra at the Kennedy Center in D.C. and it was awesome. Pink Martini is based out of Portland, Oregon, but my discovery and following of the band has been largely a D.C. experience for me. I moved to the D.C. area for graduate school and several other friends from my undergraduate college also moved to the area. One friend had a photograph of hers chosen to be part of a Bethesda gallery exhibit. I had no car and took the metro there. On the way back, a bunch of us piled into a different friend’s car. She played Pink Martini as we swung around the Beltway. I was immediately struck by the exuberant, warm and inviting music. Years after that first listen, long after I’d discovered Pandora.com and established a “Pink Martini” online radio station, I heard that Pink Martini was going to be at Wolf Trap, an outdoor concert venue in northern Virginia. Two cousins, one cousin’s husband, other cousin’s friend, my friend M. and I all optimistically bought uncovered seating on the lawn. Of course, there was a thunderstorm. All of us lawn concert-goers stalwartly held up umbrellas as we waited for the concert to start. And with only ten minutes or so to spare, the storm went away, and Pink Martini took the stage as a lovely summer evening commenced and the stars came out. With good company & good music, I felt supremely content. I heard several new songs from Pink Martini that night, but the one that perfectly matched the evening was “Splendor in the Grass”. By the time trumpet player Gavin Bondy finished the song out, I was transported. NPR nerds like myself got several treats at the performance. Apparently, White House correspondent Ari Shapiro is a huge fan of Pink Martini. As band founder Thomas Lauderdale explained, one night – at a party after the thunderstorm concert at Wolf Trap (!) – Pink Martini band members found out that Ari Shapiro could sing quite well. So well, in fact, that he was invited to sing a number of songs with the band at their Kennedy Center peformances. * Looking very sharp in his suit, Shapiro acquitted himself well. He was obviously thrilled to be there, saying that this experience ranked up there with being on Air Force One. At one point, Scott Simon was also cajoled up onto the stage from his seat in the audience to help sing along with a Turkish song. This he gamely tried to do despite his self-admitted lack of musical ability and despite not knowing Turkish. For the last song “Brazil”, an Oregonian congressman and his staff were also persuaded onto the stage and handed maracas and other small percussion instruments. Rather a Washington D.C. moment right there. And thus ended my little glamorous night. Subtitle: The War in Eastern Bosnia 1992-1995. 2000. Fantagraphics Books. 227 pages. 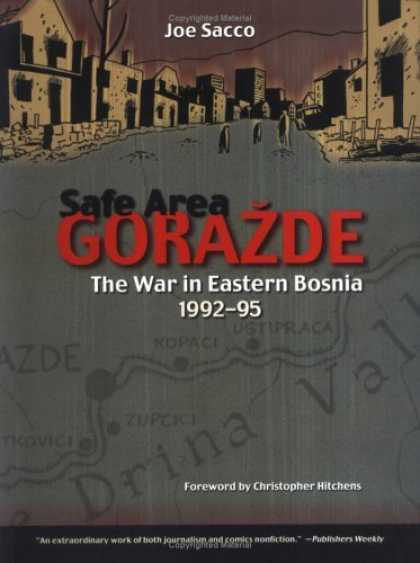 Safe Area Gorazde is fascinating just by being what it is: a journalist’s account of a conflict told to us in graphic novel format. It makes you want to see how such a thing is done. Sacco also started his novel by describing his 1995 arrival in Goradze via the UN convoy, and introducing the town of Gorazde, and the people who were still there. Gorazde was one of the villages in Eastern Bosnia that was designated by the UN as a safe area for civilians but was attacked nonetheless by the surrounding Bosnian Serb army. In many chapters, the graphic novel jumped back in time through the recollections of those who lived in Gorazde during the siege and attacks. In other chapters, Sacco came back to 1995, and examined how the people of Gorazde viewed the future, now that peace accords were being hammered out. Sacco has a frank artistic style, and the people depicted were expressive and toothy. (I don’t know why the teeth really jumped out at me in this graphic novel, but they did.) The most harrowing portions of the book for me were Sacco’s interviews with the people who had fled to Gorazde from villages that had been “ethnically cleansed.” An older man from Visegrad described seeing men, women and children killed methodically on a bridge. Sacco captured the fear and ghastliness of the man’s experiences. The 1995 chapters are not as bleak, and Sacco works in some understated humor there. I liked that he interspersed these chapters among the accounts of the war. I got a little confused with chronology sometimes, but the contrast highlighted by this interspersing of the 1995 ‘peace’ time with the war stories helps in the understanding of both. What Safe Area Gorazde brought home to me is how quickly neighbor can turn against neighbor and how sad it is when the value of peaceful community is trumped by an aggressive, violent allegiance to a cause or way of seeing things or to “one’s own kind”.